Beach huts by the Baltic sea in Höllviken, Sweden. At many seaside resorts, beach huts are arranged in one or more ranks along the top of the beach. Depending upon the location, beach huts may be owned privately or may be owned by the local council or similar administrative body. On popular beaches, privately owned beach huts can command substantial prices due to their convenient location, out of all proportion to their size and amenity. A pre-war wooden beach chalet at West Bexington, Dorset sold at auction for £216,000 in 2006, and a beach hut on Mudeford Spit sold for £170,000 in 2012. However these were exceptional as in both cases overnight stays were possible. Prices in 2009 for typical huts around the UK started from £6,000 in Walton on the Naze and typically up to £35,000., In January 2016 a beach hut was sold in Brighton, Victoria, Australia for a record $285,000. Today there are believed to be around 20,000 beach huts in the U.K. Locations where beach huts can be seen include Lowestoft, Southwold, Walton-on-the-Naze, Frinton-on-Sea, Abersoch, Langland Bay, Rotherslade, Rustington, St Helens, Isle of Wight, and Mersea Island. Locations in other countries include Wimereux, France, Cape Town, South Africa, Nesodden, Norway and Brighton and elsewhere around Port Phillip, Australia. The noted bathing boxes at Brighton in Australia are known to have existed as far back as 1862. The bathing boxes are thought to have been constructed and used largely as a response to the Victorian morality of the age, and are known to have existed not only in Australia but also on the beaches of England, France and Italy at around the same time. They had evolved from the wheeled bathing machines used by Victorians to preserve their modesty. George III used a bathing machine at Mudeford in 1801, while Queen Victoria installed one at Osbourne House on the Isle of Wight in the 1840s. In the early 20th century, beach huts were regarded as "holiday homes for the toiling classes", but in the 1930s their image revived, George V and Queen Mary spent the day at a beach hut in Sussex, and other owners have included the Spencer family and Laurence Olivier. During World War II all UK beaches were closed, the reopening in the late 1940s and 1950s led to resurgence of the British beach holiday and the heyday of the Beach Hut. While many beach huts were former fishermen's huts, boatsheds or converted bathing machines, some of the earliest purpose built beach huts in the UK were erected at Bournemouth, either side of Bournemouth Pier in 1909. Designed by F. P. Dolamore, Bournemouth's Borough Engineer, they were offered for hire for £12 10s per year. 160 huts, or bungalows as they were styled, were initially built before the World War I. Today, Bournemouth features around 520 huts owned by the Council; there are in addition a further 1200 privately owned huts. They vary in style from the traditional, wooden, shed-like constructions to the ultra modern, concrete terrace style huts such as the 1950s Overstrand beach huts at Boscombe. These were renovated to designs by Wayne and Gerardine Hemingway, founders of the Red or Dead label, as Beach Pods for the Surf Reef opened in Autumn 2009. The Queen's beach hut in Norfolk was destroyed by fire in 2003. The building had been owned by the Royal Family for 70 years and was known to be much loved by the Queen. More recently the artist, Tracey Emin, sold her Whitstable beach hut to the collector, Charles Saatchi, for £75,000. This hut was also destroyed by fire when the warehouse where it was stored burnt down. In April 2011 Bournemouth Council obtained planning permission to site a beach hut "chapel" on the sand to host wedding and civil partnership ceremonies. The "super beach hut" is located on Bournemouth's beach under the West Cliff lift. ↑ Savill, Richard (27 July 2007). "A monster price secures beach hut on Dorset's Jurassic Coast". The Daily Telegraph. London. ↑ Allen, Emily (23 July 2012). "A (very) little bit of luxury: Britain's most expensive beach hut snapped up for a whopping £170,000 in just TWO days". Daily Mail. Retrieved 23 July 2012. 1 2 3 Frith, Maxine. The tide turns against beach huts as charges erode seaside property prices, The Independent, March 25, 2005. Accessed September 14, 2015. ↑ Gillilan, Lesley (17 July 2009). "Britain still loves the beach hut". The Daily Telegraph. London. ↑ "History - Pre and Post European settlement to 1930". Brighton Bathing Box Association Inc. 2008. Archived from the original on 20 November 2008. Retrieved 14 January 2009. ↑ "Home - The Brighton Bathing Boxes Melbourne, Australia". Brighton Bathing Box Association Inc. 2008. Archived from the original on 14 April 2009. Retrieved 27 February 2009. ↑ Hickman, Martin. Seaside scramble: Britain's beach hut love affair, The Independent, July 31, 2006. Accessed September 14, 2015. ↑ "Bournemouth beach hut chapel 'first' to host weddings". BBC news. 8 March 2011. Retrieved 9 July 2011. 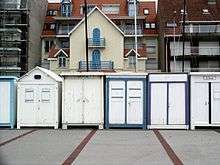 Wikimedia Commons has media related to Beach huts.